Almost four years after it first came out on Wii U, Captain Toad: Treasure Tracker is now on Nintendo Switch. How well does it hold up? Our review. When Captain Toad: Treasure Tracker first released on Wii U back in 2014, it represented something wildly different for Nintendo's Mario universe. It's a world that had been predicated on jumping, platforming, and stomping on enemies. But Nintendo presented themselves with the challenge of setting a game in this world without many of those bedrocks. The result was a unique puzzle game starring Super Mario 3D World breakout character Captain Toad, a game that proved to be one of the best games on Nintendo's fledgling console. So it makes all the sense in the world to re-release this gem four years later on the Nintendo Switch, a platform with a much greater install base. It's not a perfect transition, as it does stumble a bit in the move to Nintendo's new console, but the spirit of Captain Toad remains mostly intact and it feels as wonderful now as it did back then. The story of Treasure Tracker is a simple one. Captain Toad and Toadette discover a gold star, but are abducted by an evil bird. Toadette tenaciously clings onto the treasure, but as a result, she needs to be rescued. Captain Toad wanders through different areas of the Mushroom Kingdom, in single-screen puzzle settings, in which the object is to collect each stage's star. 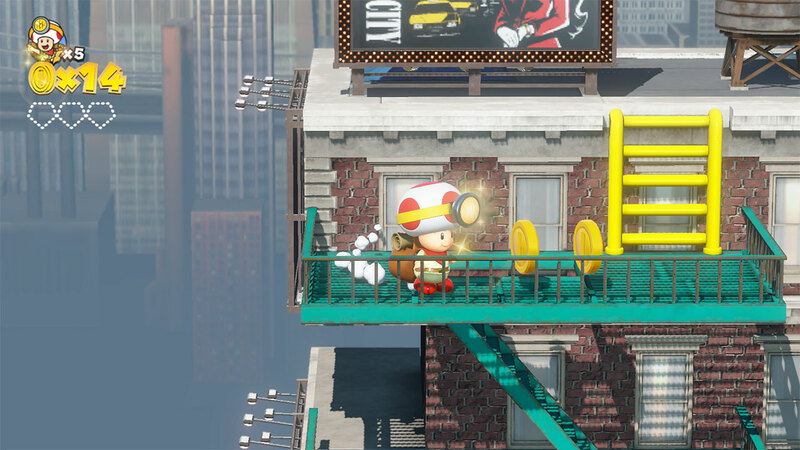 Captain Toad isn't Mario, which is what makes this setting interesting. He has none of Mario's power, but the rules of the Mario universe still apply. Captain Toad can fall from a high area and bop enemies, he can pluck vegetables from the ground to take out Shy Guys, and cherries can create clones to help mix up the puzzle possibilities. Later levels even apply different Mario-style mechanics, like donut lifts and dash plates. But mainly, the intrepid treasure hunter plays to his own strengths, which involve avoiding danger and finding new paths by rotating the camera around. It's a test of the mind, something refreshing for this universe. With these rules in mind, boss battles become refreshingly inventive. Toad can't battle these big bads on his own, but players must approach these bosses by playing to the good captain's strengths. That means pushing forward, uncovering new paths, and reaching the finish. It's a fun approach, because it doesn't lead so much to Toad beating the bosses, but the bosses beating themselves, Inspector Gadget-style. It adds to this game's distinct whimsy and sense of humor immensely. Each stage has numerous items to find, offering immense replay value. Even after finding everything in a single run, players are challenged to find Pixel Toad on a second run in a special hide-and-seek mode. Originally tied to the Toad amiibo in the Wii U version, this special feature now comes as a standard part of the game. One of our original grievances with the Wii U version of Captain Toad was that it didn't feature any kind of co-op play, given that the premise of having dual explorers in Captain Toad and Toadette seemed to lend itself to this idea. The Nintendo Switch version of Captain Toad does feature co-op, but it borders on painful. 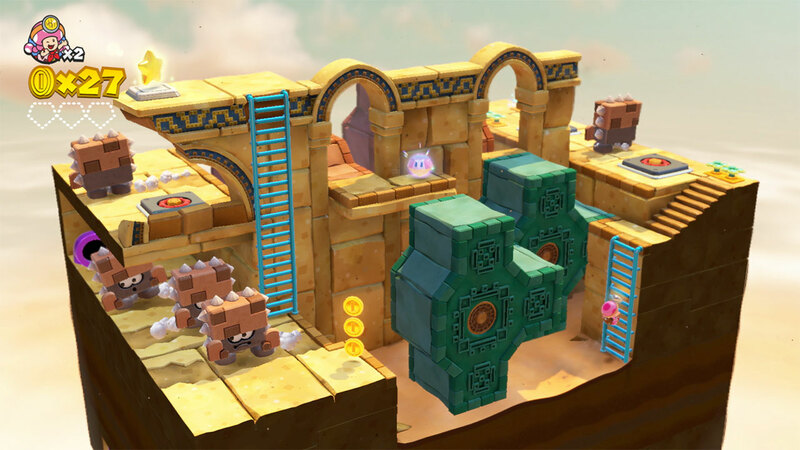 The idea is that one player uses the left Joy-Con to maneuver Captain Toad around the world, avoiding hazards and finding the various treasures of each stage. The second player is an outside presence and can help out by tossing an infinite amount of turnips to take out enemies. Player two can also use those turnips to point out anything on-screen that the first player may be missing. That's all fine on paper, but the problem is that player two is in full control of the camera and that's where things fall apart. Because the camera is such a major element of this game and is a key component to getting through levels, leaving that agency to a second person often turns into a mess. It's much worse in the game's minecart levels, as aiming is critical in order to collect everything. There's really no way to alleviate this issue, either, without removing many of the second player's functions. It's a frustrating exercise that will tend to lead to arguments with loved ones. What sets the newer versions of Captain Toad apart are four all-new levels based on Super Mario Odyssey. These are unlocked either by finishing the game or by using any of the Super Mario Odyssey amiibo. 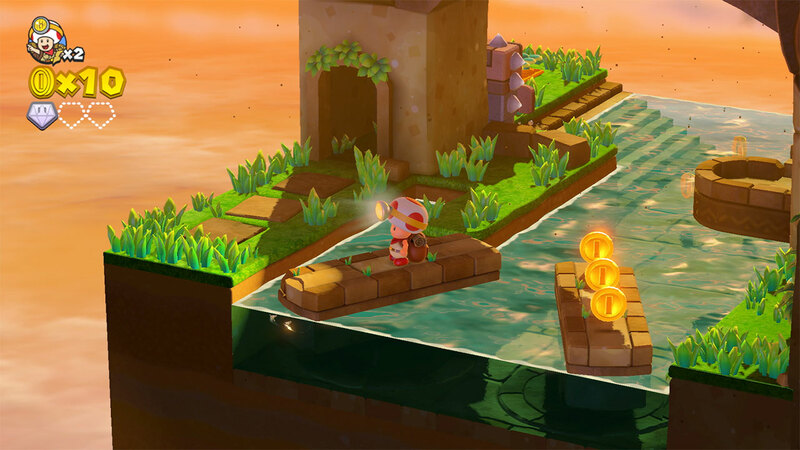 These stages show the great potential of the Captain Toad formula on any kind of sequel that would utilize the Mario Odyssey worlds and mechanics. The Inverted Pyramid, for example, requires players to turn the stage upside-down at one point and turn everything dark. New Donk City sees Captain Toad go up and down skyscrapers, putting a greater emphasis on verticality. This special section is way too short and feels like a trial run for a newer Captain Toad game, which is an outcome this reviewer hopes to see come to fruition. Captain Toad: Treasure Tracker is every bit as charming on Switch as it was on Wii U. It starts off as a serene puzzle game that picks up in intensity as players get through each of the game's three chapters and dive deeper into the standard Mario level designs. It's brilliantly creative and will challenge players on both a mental and mechanical level. It's not too difficult a game, but it was still nice to see that this newer version of the game comes with an invincibility mushroom if players die too many times on a single stage, similar to recent Mario games. There are a scant few places where Captain Toad trips up. The co-op has already been discussed, but in addition to that, the game feels fully designed for portable play, with certain mechanics handling better with the Switch's Handheld Mode. Playing with a Pro Controller on the big screen doesn't quite feel so intuitive, particular with the Pro Controller's gyroscope used for aiming. Arguments about the Wii U's ultimate success or failure aside, I personally felt like Captain Toad handled much better with the two-screen design, especially since certain elements are designed with a touch screen interface in mind. But even with those minor quibbles in mind, Captain Toad is a happy game and those are becoming fewer and farther between in the modern landscape. The world needs a game like Captain Toad, with a bright-eyed protagonist who takes time out to appreciate his surroundings. Just try to look at Captain Toad looking outside a train clapping playfully and not walk away believing he's the hero this gaming generation truly needs. This review is based on a Nintendo Switch digital code provided by the publisher. Captain Toad: Treasure Tracker is available now on the Nintendo eShop for both Nintendo Switch and Nintendo 3DS for $39.99. The game is rated E.